Anonymity might make for a compelling presence but not even the most obscure black metal band can escape the public eye. After participating in a three-way split with other lesser-known and questionably successful Hellenic bands this past spring (Vacantfield and End), the aptly and simply named Awe has released its own triptych of tracks in November, and with it will assuringly draw some attention. Three tracks, it seems, would demand a higher degree of coordination and continuity among its minimal constituents but Awe knows the game very well by now and doesn’t disappoint with their pattern number. What one should realize about such over-reaching black metal as this is that despite its imposing runtime, and therefore its analogous nature to a directionless labyrinth, there is but one simple path to focus on. 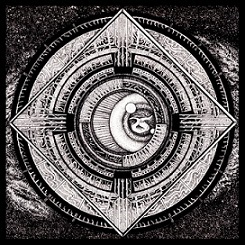 Taking directional and structural cues from Blut aus Nord’s 777 trilogy is indeed the start and end point for Awe’s debut release, Providentia, which recalls mostly the Sects album with its winding, supple passages of not necessarily violent black metal but a form most lithe and serpentine in its patient but persistent crawl. It wears the listener down with its consistency and therefore its monotony, and indeed the first track, “Actus Primus,” will cull the herd right quickly but only to prime the ears for a bit more diversity on the following track. “Actus Secundus,” with its rhythmic trem picking and atonal leadwork allow for psychedelic curves and bends in a soothingly droning epic perhaps recalling Greek mythology or ancient Gnostic philosophy, a lyrical style very reminiscent of Deathspell Omega. Carving a bit more off the French chopping block of Aosoth later on but only in a low-impact style due to its clean production, subdued mixing, and occasional use of synths, Awe finds a spot for itself within a “lounge” style of black metal that is neither aggressive nor excessively loud, even when it tries to be. The sole exception is towards the end of the album on the final track, “Actus Purus,” when there is a truly frenetic crescendo that grudgingly fizzles into a dirge-fused doom slough, a short-lived and bittersweet burst before the album’s final exhalation. It’s a great note on which to end things, and it certainly leaves a lasting impression that segues back into the opening track quite nicely. Awe, again, it has to be mentioned, is indeed aptly named and although they might not pay tribute to their roots (such as Katavasia or Macabre Omen earlier this year), they are still a solid (unorthodox) Greek black metal band that should hopefully generate some more buzz with this release. This entry was posted in Reviews and tagged Aosoth, Awe, black metal, Blut Aus Nord, Deathspell Omega, End, Greece, Greek Black Metal, Katavasia, Macabre Omen, Pulverized Records, Vacantfield. "Heavy Metal Hänsel" knows no other form of music and vehemently denies its existence when challenged. Left with only his primal instincts and encyclopedic knowledge of Iron Maiden lyrics to defend his beliefs, he lashes out at nonbelievers and naysayers with falsetto abandon.